A friend of mine is what you might call a manic collector of desert wildflowers, rushing out after seasonal rains to tally the first signs of everything from anemones to zinnias. She reminds me of those possessed birdwatchers who'll jump into a car or onto an airplane and travel across the globe to catch a glimpse of some rare species to add another number to their life list -- except that, living in the desert outside Tucson, she doesn't need to travel far in a good year to find countless wildflower varieties to add to her roster. You won't break any wildflower-watching records by finding the following ten desert flowers; most of them are fairly common in the Chihuahuan, Mojave and Sonoran deserts. But if you look for them, you're certain to come across many other kinds of flowers and to familiarize yourself with the processes of desert ecology that bring them into being. 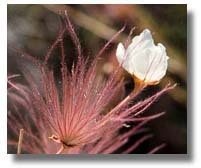 The Apache plume, a dense shrub with a silvery white flower head that blooms from May to October, grows at a range of elevations alongside everything from saguaros to ponderosa pines. Some of the largest specimens are more than seven feet tall, but the average plant is far shorter, especially at higher elevations. 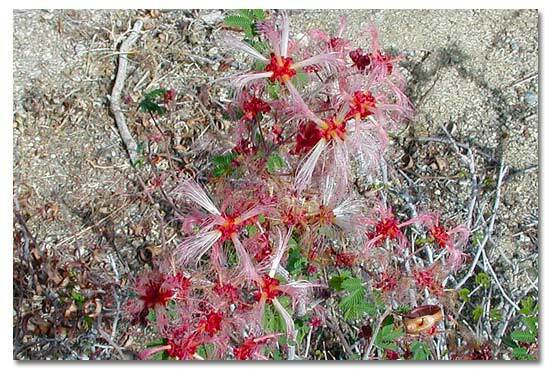 Thomas Kearney, the noted authority on desert flora, observed in the 1940s that Hopi Indians used a shampoo made of Apache plume to stimulate hair growth -- a use that ought to attract many men to the flower. Abundant and beautiful, this poppy well deserves its place as California's state flower. The life cycle of the California poppy, a so-called "drought escaper," is ideally suited to the low rainfall of the Mojave Desert. The poppy's seeds lie dormant until triggered by rains. Then the plants flower quickly and scatter their seeds, which, in turn, lie dormant until the next season of abundant winter rains -- which may not come for years. 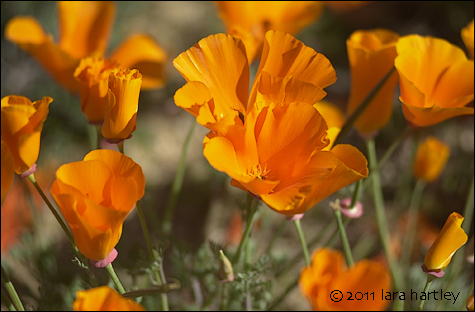 When the rains do come, however, California poppies and other showy annuals (such as lupines, mariposa lilies and goldfields) burst forth and carpet the sandy valleys and rocky hillsides with a sea of orange and yellow and blue, beckoning pollinators. Like other poppies, Eschscholtzia californica has sedative and pain-reducing properties, and desert Indian peoples used it to remedy toothache and insomnia. Chuparosa, which means "rose-sucker" in Spanish, refers not to this delicate bell-shaped flower, but to the hummingbirds that it so readily attracts. Mexico and Central America abound with some 60 species of this beautiful plant, but only this species extends into the United States, and then no further north than desert watercourses of southern Arizona and southeastern California. The common dandelion (Taraxacum officianale), like the coyote, is one of nature's great opportunists, able to thrive in a wide range of environments. A native not of the Southwestern deserts but the semiarid plains of Central Asia, this dandelion was probably introduced with other cattle-forage crops and now grows in abundance throughout North America. The unrelated desert dandelion thrives in sandy desert, dry washes and scrubby plains, sending out bright yellow flowers in late spring. A common flower in the saguaro forests of the Sonoran Desert, the desert marigold grows in large clumps, often to a height of two feet. The leaves and stems are a kind of dull, even nondescript green, densely matted to protect the plant from ultraviolet rays and to help it retain water.. 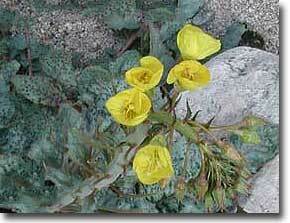 The wide flowers, however, are a brilliant yellow, highly esteemed by drylands gardeners and many bird species alike. The name "marigold" is widely supposed to honor the Virgin Mary, although it may, in fact, derive from the Old English "mere," meaning marsh. The Latin species name brevipes means "shortfoot," an apt name because this member of the primrose family, Onagraceae, keeps its flowers close to its body. An especially wet late fall and early winter will assure a good crop of these brilliantly colored, reddish-orange or yellow flowers, which favor sandy desert flats. Its cousin the dune evening primrose (Oenothera primiveris) prefers the same terrain, as does the lilac-colored sand verbena (Abronia villosa). When the three bloom together, the visual effect and perfume are stunning. Devil's claw is a coarse, ground-hugging plant that sends out maroon or copper-colored flowers a foot high. The fruit of the plant, which is fairly common from southern California to west Texas, divides in half, its core forming a horn-shaped "claw" that catches the passing wind -- or the tail of an obliging cow -- to be borne elsewhere and thus scatter its seeds. Among the Tohono O'odham, an indigenous people of southern Arizona, the dried claw was prized for its strength and durability. It was used as a kind of needle for basketmaking. A relative of both the geranium and flax, dock is also known as canyon ragweed -- an undignified name, to be sure, but one that describes its habitat well. Favoring partially shaded desert canyons, but also open desert, dock sends out abundant cream-colored flowers in late February. Desert Indian groups used them in a tea as an astringent, and internally for liver diseases of various kinds. The fairy duster, a low shrub, grows densely in sandy washes, desert flats and arid grasslands from southern California to western New Mexico. This shrub is inconspicuous for most of the year, but when the spring bloom arrives, it sends out ball-shaped clusters of pink flowers giving the plant its name. Related to the tropical acacia and mimosa, the fairy duster is a favorite of desert gardeners -- and of hummingbirds, which it readily attracts. The mariposa lily, which resembles the tulip, is often found in close association with the low-lying creosote bush. It is characterized by a brilliant vermilion flower in California that, for unknown reasons, shades off into orange in plants growing farther east. It also lives at higher elevations, such as the front range of the Santa Catalina Mountains north of Tucson. Wherever it dwells, the mariposa lily is an uncommonly lovely flower that adds stately color to an early spring garden. For a complete Wildflower Field Guide with photos click here. Most digital point-and-shoot cameras have a macro function - usually symbolized by the icon of a little flower. When you turn on that function, you allow your camera to get closer to the subject, looking into a flower for example. Or getting up close and personal with a bug. More on desert photography.